Yet another Tesla Model S has crashed, and once again the driver has blamed the Autopilot. The Culver City Fire Department said in a tweet Monday that a Tesla Model S traveling at 65mph rear-ended a fire truck parked on the Interstate 405 in California. 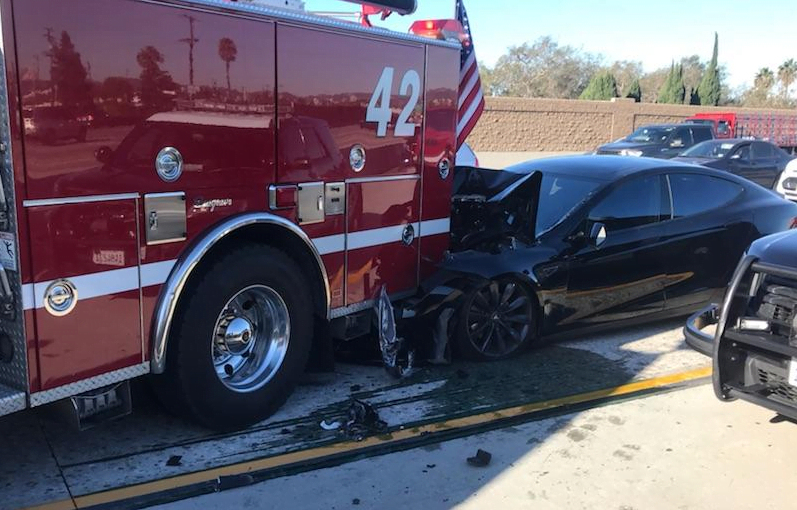 The Culver City fire engine was attending to a “freeway accident” when the fire truck was hit by a shiny black Tesla Model S. The driver claims the car was one Autopilot. Or was it? The fire truck sustained only minor damage while the electric vehicle was seriously damaged on the front, though the driver survived. He told the California Highway Patrol (CHP) that his car was on Autopilot when it rammed into the fire engine. Apparently, the driver was under the influence of alcohol. According to the CHP, his blood alcohol level was found to be two times higher than the legal limit. The driver has been arrested and charged with the “suspicion of DUI (driving under the influence).” The vehicle was taken to the tow yard, and “no it didn’t drive itself to the tow yard.” Officials suspect that the driver was trying to defend himself by blaming the Autopilot. In a separate accident that took place in San Francisco last week, the Tesla driver had blamed the Autopilot. Tesla can analyze a car’s data to see whether the vehicle was indeed set on Autopilot. The company hasn’t made an official statement yet. The Consumer Watchdog President Jamie Court told CBS Local, “It looks to me at first impression, Autopilot was engaged.” There could have been a serious problem with a robot mechanism that Tesla hasn’t fixed, said Jamie Court. Court has repeatedly voiced concerns about Tesla’s Autopilot feature. He said the Autopilot could “miss trucks that are in a color scheme that matches the background of the scene they are in.” Tesla has told consumers and media in the past that the feature was intended for use only when the driver is “fully attentive.” The company has bluntly told users that they have to pay attention even when the Autopilot system is engaged. The Autopilot feature does not offer fully autonomous driving capabilities, but its name might suggest more than what it is capable of. The feature is designed to get the driver’s attention if and when it detects a challenging situation. If the driver doesn’t respond, it brings the vehicle to a halt. Should a drunk driver engage the Autopilot? The latest crash in California raises serious questions about driver responsibility. Do you think it’s OK for a driver under the influence of alcohol to engage the Autopilot system and expect to take them home? It may become possible in the next few years or decades, but self-driving technology is still in nascent stage. That’s why Tesla urges drivers to be fully attentive even when the car is set on Autopilot. Despite warnings from the EV maker, drivers sometimes get over-reliant on the Autopilot feature and stop paying attention to the road. Many Tesla vehicles have crashed in the last couple of years where the drivers were distracted. Investigations following such crashes revealed that the EV maker didn’t have enough safeguards to ensure that drivers remained attentive while using Autopilot. Sensors and computers are still no replacement for humans behind the wheel. In May last year, a Tesla Model X driver named Sylvain Juteau thought his car was on Autopilot and took his eyes off the road momentarily. The vehicle crashed into a stone retaining wall and suffered some serious damage. Should the Autopilot be blamed in this case? No. The driver was honest enough to tell the world that the Autopilot was not engaged, and it was his fault that he took his eyes off the road. The question of driver responsibility has become more important than ever before as Tesla has started delivering the mass-market Model 3 to pre-order customers, albeit in small numbers. The company has received roughly 500,000 pre-orders for the Model 3. The vehicle comes with optional Autopilot features. Tesla has to educate customers about the feature and bring more controls to prevent drivers from misusing it, says Fortune.